Kyle Bartley appluads the fans at full-time. Leeds United’s season is effectively over after they failed to beat Norwich in an incident-packed game at Elland Road. Garry Monk’s men came from three down to earn a 3-3 draw, but could not quite grab a winner in a thrilling finish after Norwich had been reduced to 10 men with the sending off of Steven Naismith. With rivals Fulham only drawing at home to Brentford it was another missed opportunity as United are still three points behind the London club with a game to play, but are plus 13 worse off on goal difference. Disappointed Leeds head coach Garry Monk reckoned the lack of experience could have been the cause of Leeds’ ultimate failure as they have picked up just five points from their last seven games. He said: “I don’t think the players were ready. “I don’t want to be critical, they have come so far and given so much, but challenging in this type of situation has probably come a little bit too soon. 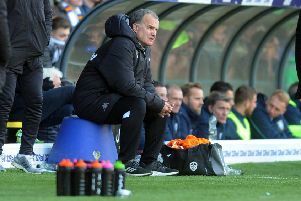 Leeds started brightly in their must-win last home game of the season, but despite getting good positions they struggled ti create chances with the final ball poor. It summed up their early play when Eunan O’Kane, restored to the midfield, saw his smart through ball just run away from Kemar Roofe and Pablo Hernandez got in behind down the flank only to drill a cross that was too strong for Chris Wood to direct the ball on goal. Ivo Pinto sent an early warning that Norwich had come to play with an angled wide that went just wide. But it was out of the blue when they took the lead in the 28th minute as Naismith launched a terrific strike from 25 yards out that flew past Rob Green into the net. The Leeds defence that has been so good this season, suddenly fell apart as Nelson Oliveira had a good chance only to send a bending shot just wide. On 34 minutes Oliveira did find the net when left with a tap-in to score from Josh Murphy’s cross. A minute later Oliveira was in again only to shoot wide, but Norwich made it 3-0 on 44 minutes as Jonny Howson’s break led to Oliveira turning inside Pontus Jansson to score his second. It looked all over for the Whites, but within seconds they responded as Stuart Dallas’s cross was volleyed in from close range by Wood. If that gave them a glimmer of hope the comeback was really on four minutes into the second half when a corner was headed down by Jansson and somehow bundled over the line by Kyle Bartley in a mass scramble in the area. With the huge crowd roaring them on Leeds nearly scored again when Hernandez had a shot blocked then O’Kane produced a great run into the box and his cross was flicked just wide by Roofe. Norwich remained dangerous on the break and Oliveira was clean through on an angle, but saw his shot well saved low down by Green. Pinto was next to run through and be denied again by Green. Oliveira had a shot blocked from close range before Leeds equalised 12 minutes from time after winning a free kick on the right edge of the box. Hernandez stepped up and beat keeper John Ruddy with a curling shot. It was all hands to the pump now for the visitors and they went down to 10 men in the 88th minutes after Naismith saw red for a lunge on Ronaldo Vieira. Leeds threw everything at the opponents with Bartley sent up front and attacking substitutions made, but the ball would not quite drop for them in at thrilling finish with their last chance seeing an Alfonso Pedraza cross turned wide by Bartley. Leeds: Green, Ayling (Pedraza 72), Bartley, Jansson, Berardi, O’Kane (Phillips 82), Vieira, Roofe, Hernandez, Dallas (Doukara 62), Wood. Norwich: Ruddy, Pinto, Martin, Bennett, Dijks, Dorrans, Howson, Pritchard, Naismith (sent-off 88), Murphy (Klose 90), Oliveira (Jerome 83).